Objetive Systemic sclerosis (SSc) is an autoimmune disease characterised by progressive fibrosis. Although SSc shares pathogenetic features with other autoimmune diseases, the participation of profibrotic Th2 cytokines is unique to SSc, but the mechanisms of Th2 skewing are unknown. We have analysed the expression and function of thymic stromal lymphopoietin (TSLP), a central regulator of Th2-mediated allergic inflammation, in human SSc, primary lung fibrosis and in a mouse model of scleroderma. Methods TSLP expression was analysed by immunohistochemistry in human SSc skin, primary lung fibrosis and mouse bleomycin-induced skin fibrosis, and by quantitative RT-PCR in mouse skin and cultured fibroblasts. The regulation of TSLP expression by specific toll-like receptors (TLR)-2, -3 and -4 agonists was analysed in human dermal fibroblast cultures. The role of TSLP in skin fibrosis and local cytokine expression was analysed in TSLP receptor (TSLPR)-deficient mice. Results TSLP was overexpressed by epithelial cells, mast cells and fibroblasts in human SSc skin and lung fibrosis, and in the bleomycin model of scleroderma. In cultured human and mouse skin fibroblasts, TSLP expression was inducible by activation of TLR, particularly TLR3. In TSLPR-deficient mice, bleomycin-induced fibrosis was significantly reduced in parallel with significantly reduced local expression of IL-13. Conclusions These data provide the first evidence of TSLP overexpression in SSc and other non-allergic fibrotic conditions, and demonstrate a profibrotic role that is potentially meditated by specific changes in the local cytokine milieu. Thus, modulating TSLP may have antifibrotic therapeutic implications. Thymic stromal lymphopoietin (TSLP) is an epithelial cell-derived cytokine with the capacity to drive DC-mediated Th2 responses,13 ,14 as well as the ability to act directly on mouse and human CD4 and CD8 T-cells.15 Expression of TSLP has been found to be upregulated in keratinocytes of atopic dermatitis skin lesions and bronchial epithelial cells of asthmatic airways, where it plays a non-redundant role in Th2 mediated inflammation.14 ,16 ,17 TLR mediated responses may mediate TSLP upregulation by epithelial cells in this context.18 ,19 In addition, Th2 cytokines may provide an amplification loop by directly inducing TSLP expression in resident cells.19 ,20 This loop has been recently explored in IL-13 transgenic mice, a model of atopic dermatitis, where TSLP contributes to extracellular matrix (ECM) accumulation downstream of IL-13.21 TSLP is also involved in Th2 responses to parasitic infection where it plays a role in the acute but not in the chronic fibrotic phase of the disease.22 These observations point to TSLP as a common factor in Th2-mediated allergic and parasitic diseases, but its potential role in Th2 autoimmune fibrotic diseases is not known. To analyse whether TSLP plays a role in the pathogenesis of primary immunomediated fibrotic conditions and its specific contribution to the development of fibrosis, we analysed the expression of TSLP in human SSc and lung fibrosis and its function in a mouse model of scleroderma. Skin biopsies were obtained from the involved skin of the forearms of 18 patients with diffuse SSc (mean disease duration 2.8±0.5 years). Lung fibrotic tissues from 18 patients with usual interstitial pneumonia (UIP) as diagnosed by CT scans and lung biopsy were also analysed. Control normal forearm skin samples were also obtained from seven unrelated healthy individuals during minor skin surgery. Normal lung specimens from the Hospital 12 de Octubre pathology files were also included as controls. The study was approved by the ethics committee of Hospital 12 de Octubre, and an informed consent was obtained from all patients. The effect of TSLP receptor (TSLPR) deficiency on bleomycin-induced fibrosis was analysed in TSLPR-deficient mice (C57BL/6 background).24 TSLPR-deficient mice (homozygous knockout (KO/KO) or wild type (WT/WT)) 6-week-old littermates were selected by PCR genotyping of tail DNA. Treated skin was harvested and frozen or paraffin embedded for histological studies. Fibrosis was evaluated as the increase in the collagen-stained area on Masson's trichrome stained skin sections. Full thickness skin sections were photographed and digitalised using a Spot RT CCD camera and Spot 4.0.4 software (Diagnostic Instruments, Sterling Heights, Michigan, USA). Collagen blue-stained fractional area was quantified using ImageJ software (http://rsb.info.nih.gov/ij). For mast cell identification, toluidine blue staining was performed, and the number of cells per area was determined. Immunohistochemistry (IHC) was performed on frozen or deparaffinised tissues, rehydrated and microwave heated in EDTA for antigen retrieval. Immunoperoxidase labelling was performed with polyclonal L-18 anti-TSLP antibody, polyclonal M-17 anti-IL13 antibody (both from Santa Cruz Biotechnology, California, USA), or polyclonal ab91649 anti-IL17 antibody (Abcam, Cambridge, UK) and developed by diaminobenzidine chromogen (Vector Laboratories, Burlingame, California, USA). Matched non-immune goat and rabbit sera were used as IHC specificity controls. Additional IHC blocking controls were performed by preincubating anti-TSLP antibody with TSLP immunising peptide (Santa Cruz Biotechnology). TSLP immunostaining was semiquantitatively scored blindly to the diagnosis. Dermis and epidermis were independently scored as 1+ <25% of positive cells; 2+ 25–50%; 3+ >50%; and 0 no detectable immunostaining. Double immunofluorescent labelling of macrophages and IL-13 was performed with rat monoclonal M3/38 anti-MAC-2 antibody (Biolegend, California, USA) and goat polyclonal M-17 anti-IL13 antibody. Detection was performed with donkey antirat Alexa 488 and chicken antigoat Alexa 594 labelled secondary antibodies (Molecular Probes, Invitrogen, Oregon, USA). Collagen deposition was estimated by determining the total content of hydroxyproline in the skin. Briefly, frozen tissues were dehydrated, weighed and hydrolysed in 6N HCl at 120°C for 8 h. After neutralisation in 6N NaOH, samples were desiccated. Citrate-acetate buffer and chloramine-T (Sigma–Aldrich Química, Madrid, Spain) solution were added to each sample and left at room temperature for 20 min. Colour was developed with Ehrlich's solution, and absorbance read at 550 nm. A standard curve using trans-4-hydroxy-L-proline standard (Sigma–Aldrich) was prepared to determine hydroxyproline concentration expressed as μg per mg of tissue. Fibroblast cultures were established by explant growth in 10% fetal bovine serum/Dulbecco's modified Eagle's medium (DMEM) (Lonza, Viviers, Belgium) and used between passages 3 and 6. Normal human or mouse dermal fibroblasts were stimulated for 18 h with 1 μg/ml bleomycin or specific TLR-2, -3 and -4 agonists: 10 μg/ml Pam3Cys (EMC Microcollections, Germany), 20 μg/ml poly(I:C) (InvivoGen, San Diego, California, USA) or 20 μg/ml Lipopolysaccharide (Sigma–Aldrich) respectively. To analyse the effect of TSLP on procollagen α1(I) gene expression by reverse transcription (RT) -PCR, normal human dermal fibroblasts were maintained in DMEM supplemented with 0.5% fetal bovine serum and stimulated with 1 ng/ml of TGF-β (Calbiochem, Darnstadt, Germany), 10–500 ng/ml TSLP (Recombinant Human TSLP, R&D Systems, Minneapolis, USA), or both cytokines for 24 h.
Total RNA was extracted and 1 μg was used for first-strand complementary DNA synthesis. Quantitative PCR analysis was carried out on a 7500 Fast Real-Time PCR System (Applied Biosystem, Foster City, California, USA) using validated TaqMan Gene Expression Assays for human glyceraldehyde 3-phosphate dehydrogenase (GAPDH), TSLP and procollagen α1(I), or SYBR Green PCR Master Mix (Applied Biosystem) for mouse cytokines according to the manufacturer's recommendations. Primer sequences are described in online supplementary table S1. For relative quantification, we compared the amount of target normalised with the endogenous reference using standard curves. Data were analysed using Prism software (GraphPad Software, San Diego, California, USA). Results are expressed as mean±SEM and quantitative data were analysed by Mann–Whitney U-test. Semiquantitative TSLP scores were analysed by Wilcoxon signed rank test. A p value <0.05 was considered significant. TSLP protein was detected by IHC in Hassall corpuscles of human and mouse thymus used as positive control (figure 1). Specificity of immunostaining was confirmed by appropriate non-immune serum controls (figure 1) and blockade of immunostaining with TSLP peptide (see online supplementary figure S1). Expression of TSLP was detected in 14 of 18 (78%) human SSc skin biopsies, but it was undetectable in healthy skin biopsies (figure 1), consistently with previous observations.14 In SSc skin, TSLP was localised to epidermal keratinocytes and dermal cells, including fibroblasts, mast cells and mononuclear cells (figure 1C–E). Epidermal expression was detected in 13 SSc cases (mean semiquantitative score 1.7±1.3; p=0.04 vs healthy skin group) and dermal expression in 13 SSc cases (mean semiquantitative score 1.4±1.2; p=0.03 vs healthy skin group). Expression of thymic stromal lymphopoietin (TSLP) in human systemic sclerosis (SSc) skin and bleomycin-induced skin fibrosis. Immunohistochemical analysis of TSLP expression in human SSc and healthy skin sections. (A) Thymus (positive control); (B) healthy skin; (C) SSc skin; (D) SSc epidermis; (E) SSc skin immunostained with non-immune serum control. Insets in C and D show fibroblast and mast cell immunostaining with higher magnification. TSLP expression in bleomycin-treated mice: (F) control (saline) skin immunostained with non-immune serum control; (G) control (saline) skin; (H) bleomycin-injected mouse skin; (I) quantitative RT-PCR analysis of TSLP mRNA expression in bleomycin-injected skin (Bleo) compared with control (saline injected) skin (*p<0.001). Data are representative of three independent experiments with 10 mice per group. Bar 100 μm (A–C), 50 μm (D–H). In normal human lung, TSLP was exclusively detected in mast cells, whereas in lung fibrotic specimens from patients with UIP, increased expression by epithelial cells, mononuclear cells, and to a lesser extent and weaker intensity by fibroblasts, was observed (see online supplementary figure S2). This pattern was reproduced in the skin of the bleomycin mouse model of scleroderma. By contrast with human skin, specific TSLP expression was detectable in saline injected and also non-injected normal mouse skin, where it located to basal keratinocytes and mast cells (figure 1G). Virtually all mast cells, as identified in sequential sections by toluidine blue metachromatic staining, were TSLP-positive in normal mouse skin (see online supplementary figure S3). In bleomycin-injected skin, an important increase in the number of TSLP expressing cells due to epidermal hyperplasia and mast cell infiltration (see online supplementary figure S4) partially accounted for increased TSLP expression (figure 1H). In addition, increased expression by fibroblasts and mononuclear cells, where TSLP was not detected in normal or saline controls, also contributed to TSLP expression in fibrotic skin (figure 1H). Increased TSLP mRNA expression in fibrotic skin was confirmed by quantitative RT-PCR (figure 1I). Previous studies point to TLR-mediated responses in the regulation of TSLP expression in different cell types and also as a potential factor leading to fibrosis.15–18 To analyse whether TLR activation may induce TSLP gene expression in skin fibroblasts, we stimulated human and mouse dermal fibroblasts with TLR-2, -3 and -4 agonists, including bleomycin as a potential TLR agonist.25 ,26 In human dermal fibroblasts, poly(I:C) TLR-3 agonist induced a strong increase in TSLP mRNA expression (8.4±5.4-fold change, p<0.01), but neither TLR-2 or TLR-4 agonists nor bleomycin significantly modified TSLP mRNA expression (figure 2A). In mouse dermal fibroblasts, all TLR-2, -3 and -4 agonists but not bleomycin-induced TSLP mRNA expression (figure 2B). The strongest effect was also observed for TLR-3 agonist (17.8±7.7-fold change, p<0.05). Thymic stromal lymphopoietin (TSLP) mRNA expression in cultured fibroblasts stimulated with toll-like receptors (TLR) agonists. Cultured human (A) or mouse (B) dermal fibroblasts were incubated for 18 h with bleomycin or different TLR agonist as indicated. The ratio of TSLP to GAPDH mRNA expression was analysed by quantitative RT-PCR (Mean±SEM). Graphics are representative of three independent experiments with mouse dermal fibroblasts and five independent experiments with human dermal fibroblasts (*p<0.05; **p<0.01). To analyse the potential contribution of TSLP to the development of skin fibrosis, we compared fibrotic responses in TSLPR-deficient and WT mice. In both groups, dermal fibrosis and an increase in the collagen content of the skin was observed after bleomycin injection (figure 3A). 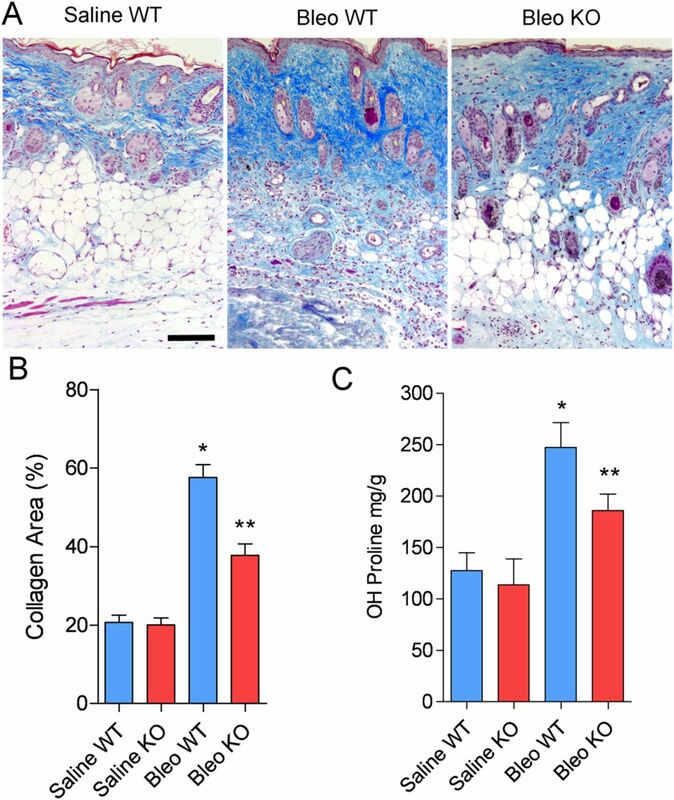 The fibrotic area evaluated as the fractional collagen stained area of the dermis was significantly reduced in the TSLPR-deficient compared with WT mice (figure 3B). The total collagen content of the skin was also significantly reduced in TSLPR-deficient mice as compared with WT mice (figure 3C). Bleomycin-induced skin fibrosis in thymic stromal lymphopoietin receptor (TSLPR)-deficient mice. Fibrosis in TSLPR-deficient (KO) and control wild type (WT) mice was measured as the collagen Masson stained area (A, B) *p<0.001 bleomycin WT versus saline WT and **p<0.002 bleomycin KO versus bleomycin WT. Collagen content was measured as hydroxyproline content of tissue per dry weight (C) *p<0.005 bleomycin WT vs saline WT and **p<0.05 bleomycin KO versus bleomycin WT. Data are representative of three independent experiments with 10 mice per group. Bar 100 μm. To rule out a direct role for TSLP in regulating procollagen gene expression, dermal fibroblast cultures were stimulated with either TSLP or TGF-β1. TGF-β1 induced procollagen α1(I) gene expression, whereas TSLP alone or combined with TGF-β1 did not (data not shown). Therefore, we analysed whether decreased fibrosis was associated with a change in local cytokine expression by determining the changes on mRNA expression for IFN-γ, IL-4, IL-13 and IL-17 on skin samples. In bleomycin-induced fibrosis, a significant increase on skin expression of IL-13 and IL-17 mRNA was observed, whereas, significant changes were not observed for IL-4 and IFN-γ mRNA compared with saline injected controls (figure 4A). In TSLPR-deficient mice, the expression of IL-13 and IL-17 mRNA in fibrotic skin was significantly reduced compared with WT mice. Cytokine expression in skin fibrotic lesions of wild type (WT) and thymic stromal lymphopoietin receptor (TSLPR)-deficient mice. Quantification of mRNA expression of cytokines IL-13, IL-17, IL-4 and IFN-γ in bleomycin-injected (Bleo) compared with control (saline) skin by quantitative RT-PCR in WT and TSLPR-deficient mice (KO), *p<0.05 bleo KO versus bleo WT. Immunohistochemical analysis of IL-13 expression in skin sections of bleo-injected skin in WT and TSLPR-deficient mice: (B) Number of positive cells per area (×200) in the different groups (*p<0.05 bleo KO vs bleo WT), and representative images (C). Data are representative of three independent experiments with 10 mice per group. Bar 25 μm. Double immunofluorescent labelling of IL-13 (red) and macrophages (MAC-2) (green) in fibrotic skin (D). Bar 12.5 μm. Arrows mark double labelled cells. We also examined IL-13 protein expression and detected it by IHC in dermal mononuclear cells of control and bleomycin-injected fibrotic mouse skin. 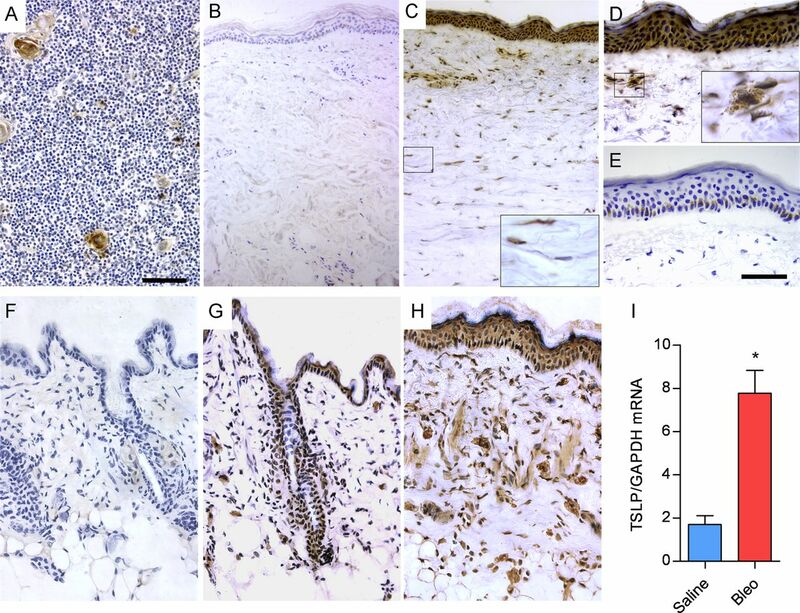 In fibrotic skin, there was an important increase in the number of dermal mononuclear IL-13 expressing cells (figure 4C), but this was not observed in skin from TSLPR KO mice (figures 4B and C). Most IL-13 positive cells in fibrotic skin colocalised with the macrophage marker MAC-2 by double immunofluorescent labelling (figure 4D). A blunted IL-17 mRNA response in TSLPR-deficient mice after bleomycin challenge (figure 4A) was observed. However, IL-17 protein was undetectable by IHC in fibrotic skin, whereas it was detected in mouse spleen used as positive control (see online supplementary figure S5). In skin homogenates, IL-17 levels, as determined by ELISA, were <1 pg/mg in all groups pointing to a relatively low level of IL-17 protein expression in the skin in this model. The capacity of TSLP to induce Th2-mediated allergic inflammation has been demonstrated in human and animal models,13 ,14 ,16 where TLR activation and Th2 cytokines contribute to TSLP overexpression by resident cells.19 ,20 ,21 Fibrosis is a late component of allergic airway or skin inflammation where local overexpression of TSLP has been shown to contribute to excessive ECM synthesis.16 ,21 We show that TSLP overexpression is common to several non-allergic fibrotic conditions including human SSc and primary lung fibrosis, and a mouse model of skin fibrosis. In this group of diseases, autoimmune inflammation is followed by local expression of Th2 cytokines and progressive fibrosis. Besides Th2 cytokines, recent data point to a Th17 component in the pathogenesis of human SSc.8 ,11 ,12 An unexpected effect of TSLP on Th17-polarisation and Th17-mediated inflammation has been recently identified under specific conditions in vitro and in vivo in a model of autoimmune arthritis.31 ,32 Although we found TSLP-dependent changes in IL-17 mRNA expression in response to bleomycin, IL-17 protein expression was not detected in the skin precluding conclusions on its role in this model. Overexpression of TSLP in human SSc and bleomycin-induced scleroderma is explained by the contribution of multiple cell elements. Epidermal hyperplasia is a prominent component in bleomycin-induced scleroderma but not in human SSc. Nevertheless, epidermal TSLP overexpression was observed in both cases. Dermal-epidermal crosstalk contributes to ECM matrix remodelling in wounds, and has recently been proposed as a pathogenetic factor in SSc.33 We also observed epithelial TSLP expression in fibrotic lungs, supporting a role for this factor in profibrotic epithelial-stromal crosstalk. Increased mast cell infiltration and degranulation has also long been recognised as a potential profibrotic factor.34–36 Mast cells are an important source of TSLP in allergic and parasitic disease37–39 and, according to our observations, in skin and lung fibrosis as well. Fibroblast expression of TSLP seems more specific for SSc, since it has not been observed in human or mouse atopic skin lesions.14 ,20 ,21 Additional mononuclear infiltrating cells may also contribute to increased TSLP expression in fibrotic tissues. Previous data point to TLR-3 activation as an important TSLP inducer and, interestingly, IFN-α upregulation of TLR-3 expression has been recently identified as a profibrotic pathway in SSc fibroblasts.19 ,40 ,41 In concordance, TLR-3 agonist induced the highest expression of TSLP in human and murine skin fibroblasts, consistently with previous studies in fibroblasts from other tissues.42 ,43 The specific mechanisms potentially involved in endogenous activation of TLR in SSc and other fibrotic diseases are not known. In the murine model, a direct effect of bleomycin as TLR agonist in fibroblasts was ruled out, suggesting that local factors induced during the fibrotic process would activate fibroblast TSLP expression. Circulating immunocomplexes containing nucleic acids are potential endogenous TLR ligands in autoimmune disease as demonstrated in lupus.44 We explored this potential mechanism in SSc by exposing fibroblasts to plasma from SSc and controls but failed to detect an increase in TSLP expression (data not shown). Further studies are needed to identify the precise mechanisms of TSLP overexpression in fibrotic diseases. These data consistently associate TSLP overexpression with non-allergic immune-mediated fibrosis, and demonstrate its contribution to the fibrotic process by modulating the cytokine milieu. In the absence of TSLP, the fibrotic response in animals is reduced, indicating that therapeutic modulation of TSLP may represent a novel antifibrotic strategy. We also thank Vanessa Miranda for excellent technical assistance and Dr José L Rodríguez Peralto for providing human lung and skin sections.
. Genomics and the multifactorial nature of human autoimmune disease. N Engl J Med 2011;365:1612–23.
. Genome-wide association study of CNVs in 16,000 cases of eight common diseases and 3,000 shared controls. Nature 2010;464:713–20.
. Systemic sclerosis: a prototypic multisystem fibrotic disorder. J Clin Invest 2007;117:557–67.
. Systemic and cell type-specific gene expression patterns in scleroderma skin. Proc Natl Acad Sci USA 2003;100:12319–4.
. Integrating mechanisms of pulmonary fibrosis. J Exp Med 2011;208:1339–50.
. Infectious disease, the innate immune response, and fibrosis. J Clin Invest 2007;117:530–8.
. Transcription factor T-bet regulates skin sclerosis through its function in innate immunity and via IL-13. Proc Natl Acad Sci USA 2007;104:2827–30.
. The pronounced Th17 profile in systemic sclerosis (SSc) together with intracellular expression of TGFbeta and IFNgamma distinguishes SSc phenotypes. PLoS One 2009;4:e5903.
. Presence of CD4+CD8+ double-positive T cells with very high interleukin-4 production potential in lesional skin of patients with systemic sclerosis. Arthritis Rheum 2007;56:3459–67.
. T cell polarization identifies distinct clinical phenotypes in scleroderma lung disease. Arthritis Rheum 2008;58:1165–74.
. Increased frequency of circulating Th22 in addition to Th17 and Th2 lymphocytes in systemic sclerosis: association with interstitial lung disease. Arthritis Res Ther 2011;13:R166.
. Distinct evolution of TLR-mediated dendritic cell cytokine secretion in patients with limited and diffuse cutaneous systemic sclerosis. Ann Rheum Dis 2010;69:1539–47.
. TSLP-activated dendritic cells induce an inflammatory T helper type 2 cell response through OX40 ligand. J Exp Med 2005;202:1213–23.
. Human epithelial cells trigger dendritic cell mediated allergic inflammation by producing TSLP. Nat Immunol 2002;3:673–80.
. New insights into the regulation of T cells by gamma(c) family cytokines. Nat Rev Immunol 2009;9:480–90.
. Thymic stromal lymphopoietin expression is increased in asthmatic airways and correlates with expression of Th2-attracting chemokines and disease severity. J Immunol 2005;174:8183–90.
. A role for TSLP in the development of inflammation in an asthma model. J Exp Med 2005;202:829–39.
. Inducible expression of the proallergic cytokine thymic stromal lymphopoietin in airway epithelial cells is controlled by NFkappaB. Proc Natl Acad Sci USA. 2007;104:914–19.
. TLR3- and Th2 cytokine-dependent production of thymic stromal lymphopoietin in human airway epithelial cells. J Immunol 2007;179:1080–7.
. 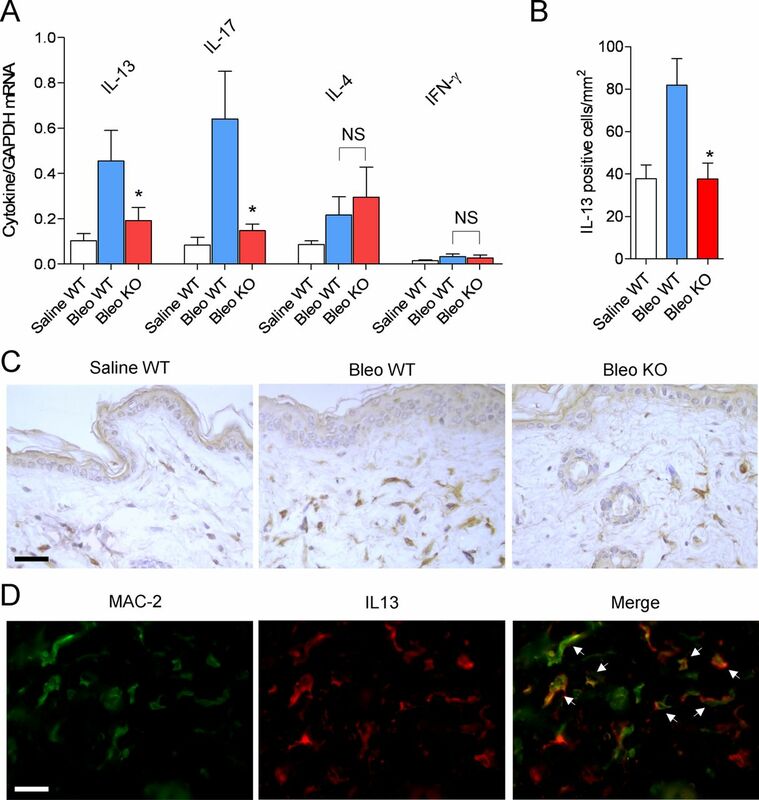 Cutting edge: proinflammatory and Th2 cytokines synergize to induce thymic stromal lymphopoietin production by human skin keratinocytes. J Immunol 2007;178:3373–7.
. Regulation of helminth-induced Th2 responses by thymic stromal lymphopoietin. J Immunol 2009;182:6452–9.
. Topical application of a peptide inhibitor of transforming growth factor-beta1 ameliorates bleomycin-induced skin fibrosis. J Invest Dermatol 2005;125:450–5.
. A role for thymic stromal lymphopoietin in CD4(+) T cell development. J Exp Med 2004;200:159–68.
. Stimulation of toll-like receptor 2 with bleomycin results in cellular activation and secretion of pro-inflammatory cytokines and chemokines. Toxicol Appl Pharmacol 2006;210:181–9.
. Targeting TLR2 attenuates pulmonary inflammation and fibrosis by reversion of suppressive immune microenvironment. J Immunol 2009;182:692–702.
. Animal model of sclerotic skin. IV: induction of dermal sclerosis by bleomycin is T cell independent. J Invest Dermatol 2001;117:999–1001.
. Upregulation of interleukin-13 and its receptor in a murine model of bleomycin-induced scleroderma. Int Arch Allergy Immunol 2004;135:348–56.
. Increased bleomycin-induced skin fibrosis in mice lacking the Th1-specific transcription factor T-bet. Pathobiology 2006;73:224–37.
. Critical proinflammatory role of thymic stromal lymphopoietin and its receptor in experimental autoimmune arthritis. Arthritis Rheum 2011;63:1878–87.
. Human TSLP and TLR3 ligands promote differentiation of Th17 cells with a central memory phenotype under Th2-polarizing conditions. Clin Exp Allergy 2009;39:89–100.
. Epithelial cells promote fibroblast activation via IL-1alpha in systemic sclerosis. J Invest Dermatol 2010;130:2191–200.
. Bleomycin-induced pulmonary fibrosis in genetically mast cell-deficient WBB6F1-W/Wv mice and mechanism of the suppressive effect of tranilast, an antiallergic drug inhibiting mediator release from mast cells, on fibrosis. Int Arch Allergy Appl Immunol 1991;95:195–201.
. Dermal mast cell degranulation in systemic sclerosis. Arthritis Rheum 1990;33:1702–9.
. Animal model of sclerotic skin. II. Bleomycin induced scleroderma in genetically mast cell deficient WBB6F1-W/W(V) mice. J Rheumatol 1999;26:2628–34.
. The role of mast cells in inflammatory responses in the lung. Crit Rev Immunol 1993;13:35–70.
. Mast cell regulation of epithelial TSLP expression plays an important role in the development of allergic rhinitis. Eur J Immunol 2008;38:1487–92.
. Mast cells orchestrate type 2 immunity to helminths through regulation of tissue-derived cytokines. Proc Natl Acad Sci USA 2012;109:6644–9.
. Poly(I:C) drives type I IFN- and TGFbeta-mediated inflammation and dermal fibrosis simulating altered gene expression in systemic sclerosis. J Invest Dermatol 2010;130:2583–93.
. Toll-like receptor 3 upregulation by type I interferon in healthy and scleroderma dermal fibroblasts. Arthritis Res Ther 2011; 13:R3.
. Thymic stromal lymphopoietin secretion of synovial fibroblasts is positively and negatively regulated by Toll-like receptors/nuclear factor-kappaB pathway and interferon-gamma/dexamethasone. Mod Rheumatol 2007;17:459–63.
. CpG-DNA suppresses poly(I:C)-induced TSLP production in human laryngeal arytenoid fibroblasts. Cytokine 2012;57:245–50.
. Chromatin-IgG complexes activate B cells by dual engagement of IgM and Toll-like receptors. Nature 2002; 416:603–7. Contributors Designed researched: AU, WJL, JLP. Performed Research: AU, MJD, EI, GC, PC, PO. Contributed new reagents or analytic tools: WJL. Analysed data: AU, GC, EI, MJD, JLP. Wrote the paper: AU, WJL, JLP. Funding This work was supported by Fondo de Investigación Sanitaria through grants PI08/0316 and PI12/439 and RIER RD12/09/016 and by the Division of Intramural Research National Heart, Lung, and Blood Institute, National Institutes of Health. Competing interests WJL is an inventor on patents and patent applications related to TSLP. The authors declare no other competing interests. Ethics approval Ethics committee of Hospital 12 de Octubre. Data sharing statement We mentioned negative unpublished data on: Collagen mRNA expression in fibroblasts stimulated by TSLP; TSLP protein expression in SSc plasma stimulated fibroblasts; T-cell polarisation in T-cells from lymph nodes of bleomycin injected mice. These data are available to any investigator upon specific request.